Rate this project SparkyLinux is a lightweight distribution based on Debian. The project's latest release is SparkyLinux 5.6 which is based on Debian's Testing 'Buster' branch. The new version includes several package updates and includes PAE support in the 32-bit kernel. Users who need non-PAE kernels are advised to switch to SparkyLinux's Stable branch. "There are new live/install ISO images of SparkyLinux 5.6 'Nibiru' available to download. This it the 4th and the last this year ISO image update of the rolling line, which is based on Debian Testing 'Buster'. Changes: system updated from Debian testing repos as of December 16, 2018; Linux kernel 4.19.9 (4.19.10 & 4.20-rc7 available at Sparky 'Unstable' repos); the Calamares installer 3.2.1; many small fixes. 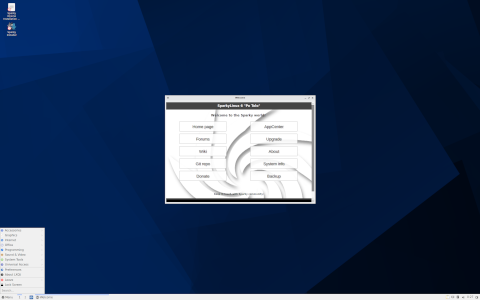 Changes of small window managers configuration (can be installed via Minimal ISO images or APTus): a previous sound applet changed by pnmixer; PCManFM file manager changed by Thunar; added packages: xfce4-notifyd, xfce4-power-manager, sparky-fileopen; Thunar daemon is enabled as default." See the project's release announcement for more details. Download (pkglist): sparkylinux-5.6-x86_64-lxqt.iso (1,325MB, SHA512, signature, torrent), sparkylinux-5.6-x86_64-minimalgui.iso (956MB, SHA512, signature, torrent), sparkylinux-5.6-x86_64-minimalcli.iso (521MB, SHA512, signature, torrent).